When you go to San Diego Comic-Con, you have to make a lot of hard decisions. There is so much to do and not enough hours in the day, so you have to choose what you want to do! I usually have press obligations and 800 panels that I want to see, and I very rarely check out the offsite activations. 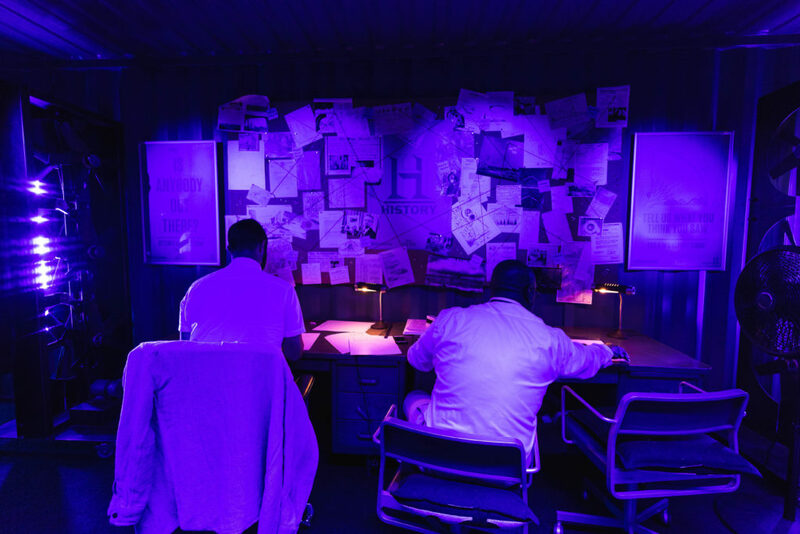 Am I glad that I chucked that rule this year and checked out the Project Blue Book offsite. Project Blue Book is a brand-new show from History Channel, but it was also a real thing – one of a series of studies done in the 1950s and ’60s by the US Air Force on unidentified flying objects. History was very dedicated to making its offsite experience as real as possible. 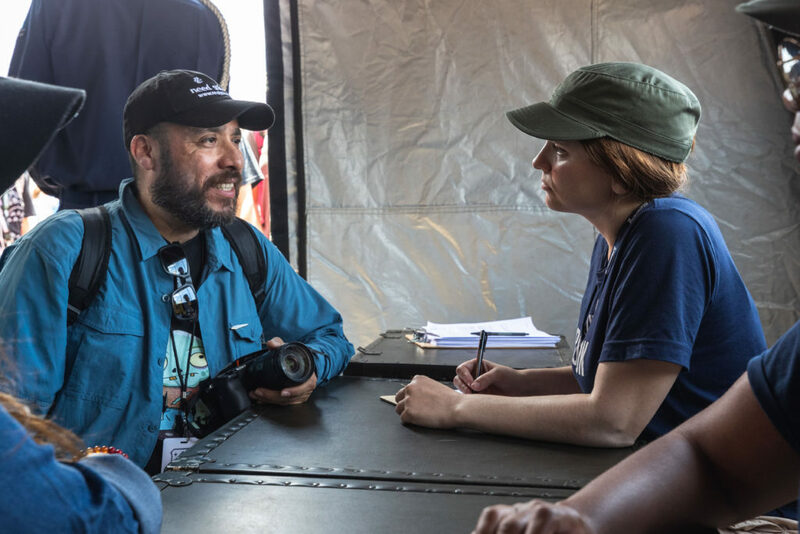 From the men in military uniform guarding the entrance to the tent, to the straight-faced woman who asked me for details on my UFO encounter, they really pulled out all the stops to create an out-of-this-world experience. 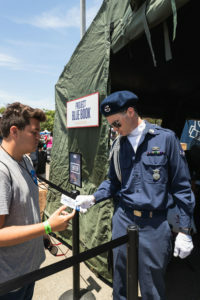 Smack-dab in the middle of “The Experience” – the oft-renamed area full of activations at Petco Park, just across the train tracks from the convention center – Project Blue Book‘s military tent gave off an aura of mystery. Most of the other activations were open, so you could see what was going on, but as befitting a military endeavor, History operated with the utmost secrecy. While waiting in line, you had to register for your “credentials” to be allowed into the tent at all. This was, after all, a top secret installation that had been re-opened solely for attendees of San Diego Comic-Con. Once inside, your first step was to log your UFO encounter with one of their trained personnel, who asked you questions about what you saw. (For the record, I saw a UFO last July as I was walking to work, which pulsed once before vanishing.) Kudos to the woman who took my statement. The fact that she was so straight-faced and deadpan made it so much easier to lose myself in the fantasy and relate an encounter that felt real, even though it was totally made up. It probably helped that the form that they used was nearly identical to the ones used in the original study. These people would then hand off the form with your answers to the installation’s resident sketch artists, who proceeded to sketch your encounter. 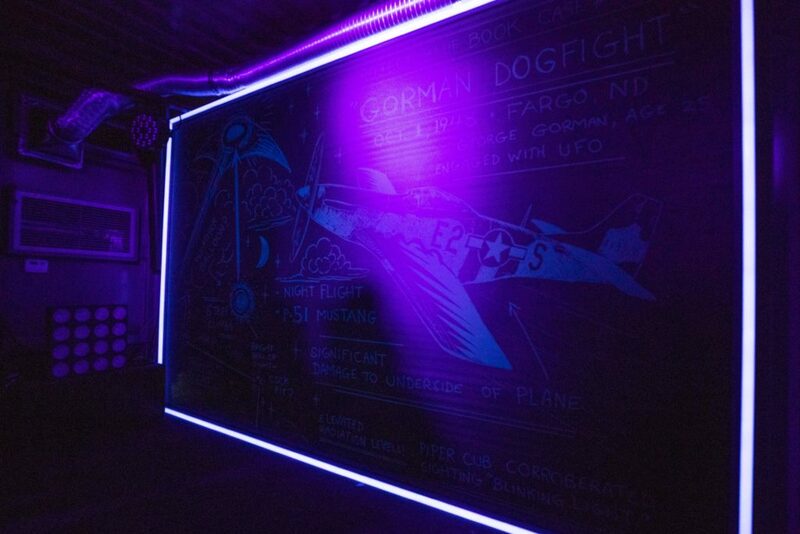 After logging your encounter, you entered a room where you were greeted with projections on the wall of actual Project Blue Book case files, as well as audio describing real-life UFO encounters from people featured in the study. From there you were led to a room which would not have been out of place in a sci-fi movie – radar and communications equipment dominated one wall, while the sketch artists diligently worked opposite. 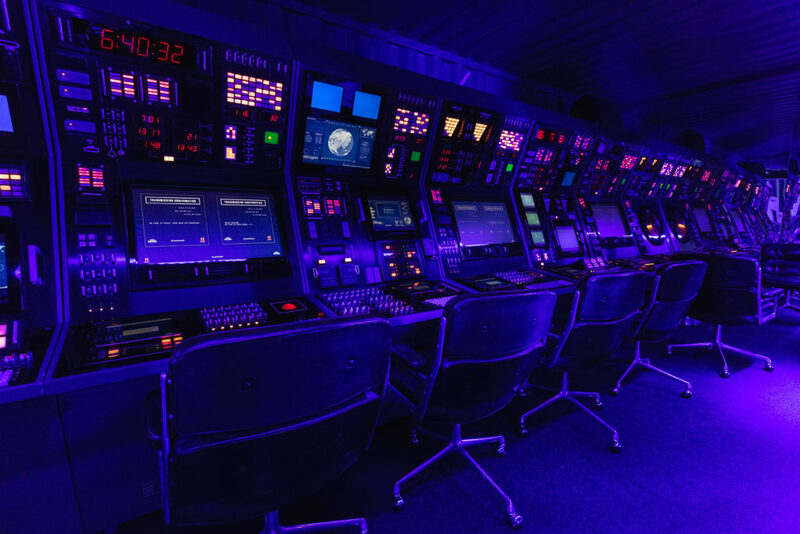 The communications equipment wasn’t just for show – one of the biggest draws of the activation was that you were able to send a message out into space. 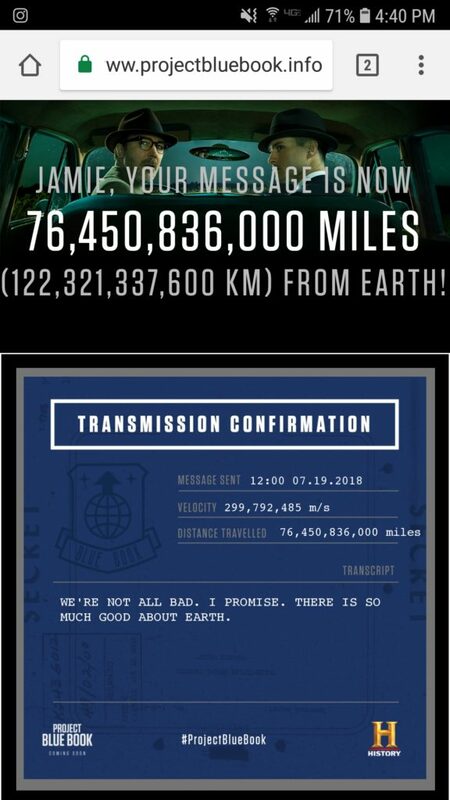 You provided your phone number, and once your message was sent, you received a text message linking you to the website, which told you how far your message has traveled into space. History really pulled out all the stops to provide visitors to the activation with a unique experience. 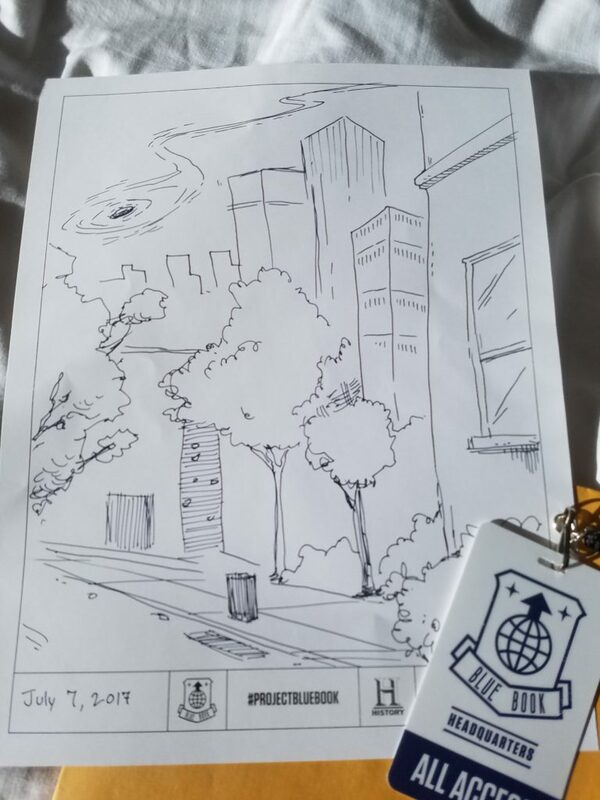 Where else could you get a personalized drawing of a UFO encounter that didn’t actually happen (or did it?) as well as the knowledge that your words are now being broadcast into outer space? That’s the kind of thing that can only happen at San Diego Comic-Con. My message to the universe! 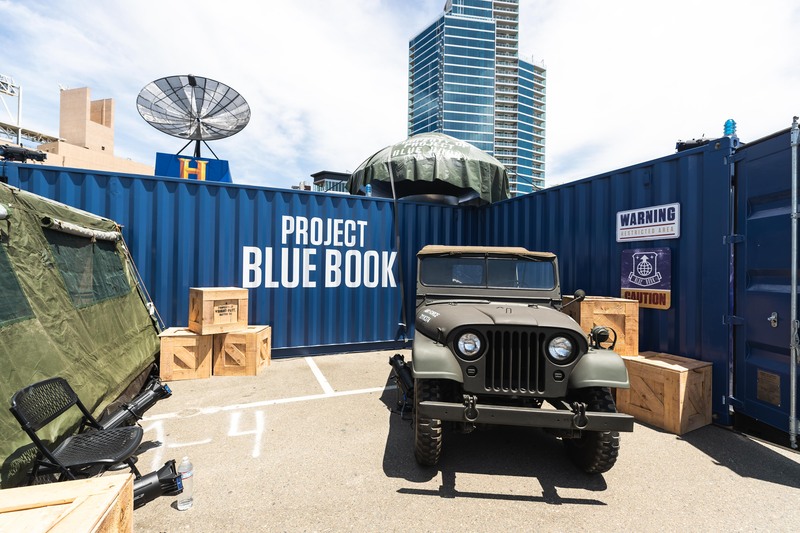 I’m so glad I took the time to visit the Project Blue Book activation at this year’s San Diego Comic-Con. 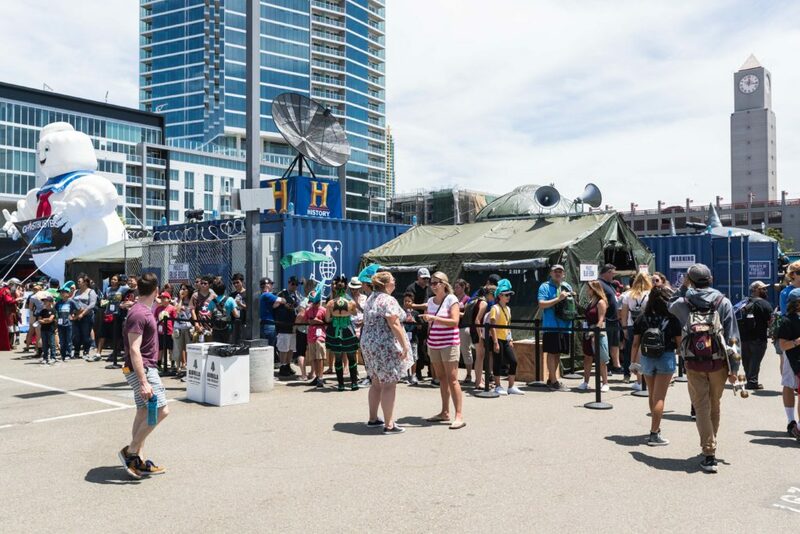 It wasn’t as extensive as some SDCC activations can be (like this year’s Jack Ryan activation from Amazon, which included an obstacle course), but it was truly a one-of-a-kind experience that provided me with both a personalized souvenir and a really neat story to tell people. Project Blue Book stars Aiden Gillan, Michael Malarkey, Laura Mennell, Ksenia Solo, Neal McDonough, and Michael Harney. It premieres this winter on History. Check out the trailer below! Previous:Supergirl at SDCC 2018: Change Is Coming And It’s Good! Next: 20GayTeen Continues at SDCC with LGBTQ News!